"Hand Made" "USA" Green Oval Stamped 'Johnny?' California? I hope someone has an idea about this piece. I'd appreciate anyone's help if you have an idea of what the mark might be. I have tried to find out what this mark is for a while. It's not hard at all to read "Hand Made" at the top and "USA" along the bottom. And it looks like a word beginning with "J' in the middle -- I thought perhaps "Johnny"? -- and then other writing that's just too faint to be able to discern. This pretty little plate (size: 6 1/4" across) came from a box of old things in a garage that I cleaned out after my mom and dad passes away a couple of years ago. I'm fairly sure that the boxes had been packed up at least 20 years. 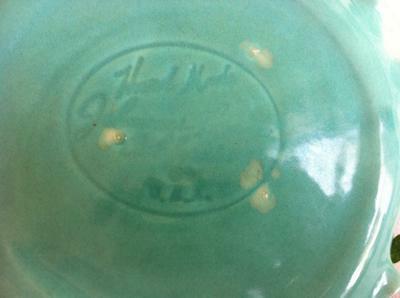 It's in good condition, with only a couple of tiny rough places on the curled ceramic "petals." I think it looks very modern in a way because it's so different looking, but I know it is at least 20 years old, because of the age of the packing in the box. Also... I don't know if you can tell from the photo, but it almost looks as if the mark is repeated on the top, or as if something else made an impression. Or maybe that's just my eyes playing tricks on me, I don't know. love of ceramics, and especially pieces that are beautiful colors. The Fiesta Ware that I have is in the main, primary colors: red (which looks orange - I have often wondered, why do they call it red?) and cobalt blue and yellow and pale green and ivory and light blue. My favorite thing is the juice pitcher with six little glasses, all the colors that I've just mentioned: red, green, yellow, light and dark blue, and ivory. I like the salt and pepper shakers, too. Not long ago, I also have started volunteering in a local nonprofit collectibles shop, and we receive items fairly often that we're unsure about, so this site would be a great resource in the future for that reason as well. I grew up in Georgia and was surrounded by old china and various knick knacks, and I certainly do wish now that I had paid more attention to all of them! I know that many nice pieces that belonged to my grandmother and mother were broken, given away, or taken to Goodwill. But at least I do have my grandmother's Hoosier cabinet, so I use that to put some of my pieces in. Because I know so little about this plate, there's not much for me to write about it. Thank you so much for any help you can give me! 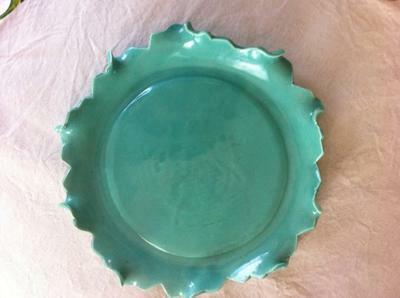 I really do like this little plate -- it's so different in the way that it was made. Also, the color almost matches my green Fiesta Ware, and it looks quite nice in the sideboard next to the Fiesta Ware. Again, thank you for your time and attention to this note about a pretty little plate! Comments for "Hand Made" "USA" Green Oval Stamped 'Johnny?' California? You did a great job telling your story. This is why this website is popular - it's warm an fuzzy and we care about people and their collections! (sorry about taking a time to answer, but I lost a batch of posts and am just catching up). This is not an obvious mark, so we need big help with this one. Let's review what we do know. So we know the mark is an oval shaped stamped/impressed mark. We know it says "Hand Made" "USA"
We also know it's a very nicely done example of American art pottery - with all those lovely hand twists and turns. The work has many 'undercuts' (a technical term to do with making plaster moulds for mass production) so this piece could not have easily been made by the moulding and casting process, and therefore surely has to be a nice example of American art pottery. And I can't see from the photos, but could it say California in the middle bit? Let's speculate it might say California, as the style and make definitely fit that 1920's to 1940's movement. There were five or six better known companies, which we talk about elsewhere, but many many smaller companies, of which this 'Johnny?' might be one. California was rich with clay, rich with hungry, creative people, it was a developing state, and all this was a melting pot (or furnace) for a beautiful array of art pottery. All of these small growing concerns had their own proud an quirky backstamps way to numerous for even an avid collector or expert to know every one of them. However, to the collector of this type of California Clay art item, the backstamp is often not as important as the aesthetics of the piece. Try harder to see what the words say, bearing in mind what I just wrote and try to get back to us. 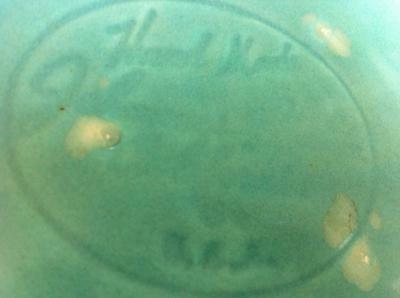 Maybe Johannes Brahm Or Johanna Ceramics both are old California Pottery. Now that's why I love this site! Thank you, Thank you, Thank you, for the above post. I followed up on both those names and although I couldn't find the same mark, I did discover that these nice crinkly edge pieces were a trade mark of Johannes Brahm California Pottery. 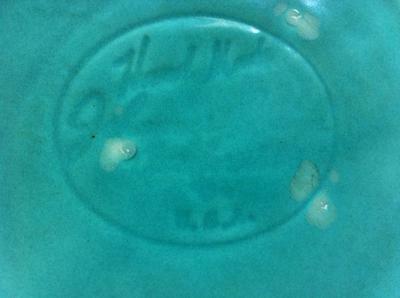 I also found him using a very similar green glaze on finish on other items. This makes me 100% certain this is mark says Johannes Brahm (or Johannes 'B') California. Here's my evidence - all we need now is for people to send me a clearer version of this actual mark. Sometimes these marks were faint and went through to the other side because they were pressed with a plaster reverse tool on soft unfired clay. They didn't want to press too hard because when they did, it showed through on the other side. Interesting post. Wow, you guys are good! The comments were really fascinating. I love that little plate; it has always felt special to me. Not only the unusual little curling edges, but also the color and size: just the feel of it. Wouldn't it be great to somehow be able to look back at the history of a a simple piece of pottery, to see who had owned it and what kind of a trail it left through the years? Your knowledgeable comments are the next best thing! Thanks so much.